More dispatches from the Sharp Park front of the San Francisco Golf Wars. This video speaks directly to a lie promoted by the Tuscon eco-extremists, certain San Francisco supervisors, and others trying to close the course - to whit - they represent San Francisco public course golfers as elitist and they paint golf as the exclusive domain of rich old white guys (Interestingly - ROWG's are the only demographic that is politically correct to disparage and hate. Even I don't like them, and I'm one of them - well... except for the "rich" part). "The Center for Biological Diversity and Nature in the City both support restoration at Sharp Park, and are primarily responsible for the existence of this website." You can read more about CBD's radical worldview and dishonest intimidation tactics in this PDF. As with all extremists, they believe the end justifies the means and will do or say anything in the service of their radical agenda. Right now - destroying Sharp Park Golf is on their "To-Do" list. Some interesting comments on the ABC website featuring this story can be found here. Dispatch #3: I wrote a short opinion piece for the SF Chronicle arguing for the application of a little common sense in the controversy. They didn't publish it, so I'll post it here. 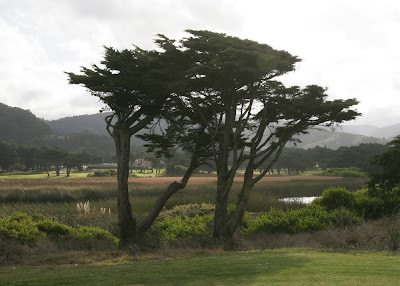 The Chronicle recently reported that the San Francisco Recreation and Park Department missed a deadline for reporting on the status and potential plans for the Sharp Park Golf Course. Among the reasons cited for the delay - the department is going to “clarify the longterm impacts of sea rise on the park”. This should come as an enormous relief to all Pacificans, San Franciscans as well as climatologists, policy makers, and leaders worldwide. Finally, the question of longterm impact of sea rise on low lying coastal areas is about to be clarified by the San Francisco Recreation and Parks Department. Perhaps what we need is a little less clarification on global warming from the city Parks Department and a little more application of common sense from our civic leaders. It is important for all interested residents to realize that the funding and driving force behind the effort to destroy Sharp Park Golf Course is coming from a well heeled out-of-state ecology organization with a reputation for intimidating municipalities with high power legal machinations. The question for us - Are we as San Francisco and Pacifica residents going to knuckle under to their legal threats or stand up to it and do what is right for our communities? There is a common sense answer to the conundrum of Sharp Park Golf Course. Local leaders need to commit to the continuation of the course. This means Mayors Newsom and Lancelle, and all SF Supervisors with last names that are not spelled Mirkarimi. We need to stop pretending that destroying the course is a realistic, reasonable or economically feasible option. Implement procedures at the course to further protect the endangered snake and frog where they have co-existed with golfers for 70+ years. That mediation plan is all the Dept of Recs and Parks should be working on now. They can solve the global warming/sea rise issue some other time. If necessary, the plan could include closing the course for a month or two during flood season when the frogs are laying eggs. Other municipal courses around the country close for months at a time due to a weather condition called "winter". It is not a problem for a properly managed course. It is a reasonable compromise. Federal stimulus money has already been allocated for a pipeline project to irrigate the course with recycled water. This infrastructure shovel-ready project will create 275 jobs, will help the local economy and will save water. It is either a perfect stimulus project as envisioned by President Obama - or - if Mirkarimi has his way, it is an incredibly wasteful boondoggle where millions in federal, state, and local funds will be spent on a “pipeline to nowhere”. Now what makes more sense? I say we proceed with the project and not waste the money. Recruit our federal and state heavy hitters (Arnold, Diane, Barbara, Nancy) to find a way to inoculate Pacifica and San Francisco against abusive lawsuits from the eco-bullies in Tucson. Historical Landmark status for this Alister MacKenzie course (as is currently being considered by the Pacifica City Council) could be just the ticket. This is not rocket science or even climate science. This is not a hard problem to solve, unless... our San Francisco Supervisors make it one. A liberal application of common sense is all that is required to solve this problem. The "liberal" part is easy to find in San Francisco City Hall. The "common sense" part? Not so much.